When ICDs are viewed next to each other, some interesting differences can be noted between ICDs we normally think of as fairly close in behavior to each other. Likewise, ICDs we think can be used to explain an event can appear so different that the possibility that such a claim is accurate is seriously questionable. In one case, what is traditionally considered a cardiological ICD has an age gender behavior too distinct from the suspected diagnoses for the old theory to be considered seriously. Even with a scientific hypothesis designed to back up that claim is produced, the difference between the actual syndrome or condition, and its theoretical equivalent, is too great for the proposed theory to be credible. Yet we often ignore the age-gender data placed before us due to the attractiveness and the apparent credibility of the individual proposing the hypothesis in the first place. 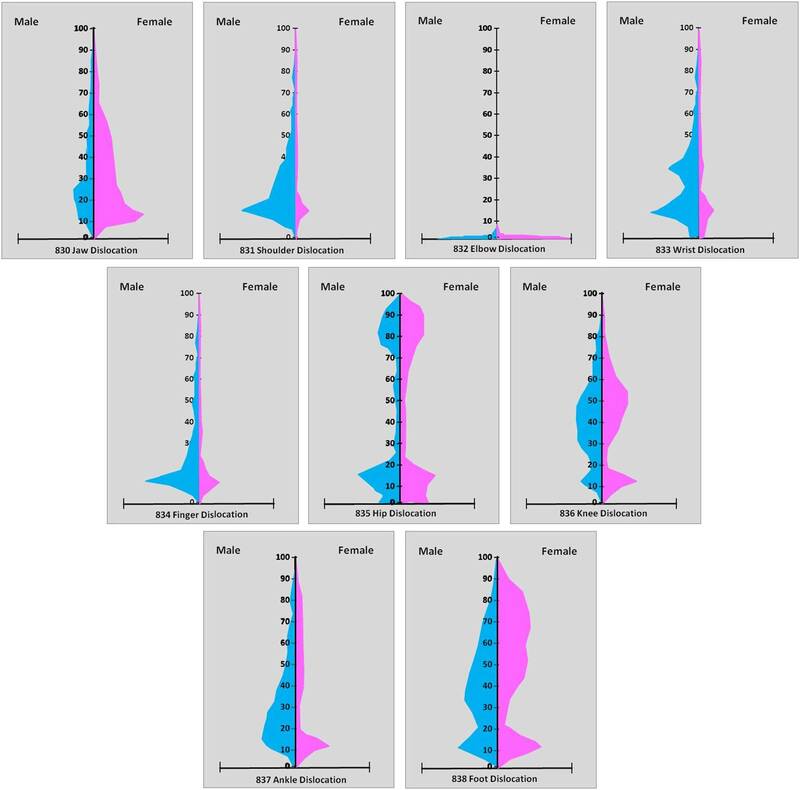 The goal for such an individual researcher should be to explain why the age-gender distribution is mismatched to the hypothesis at hand, rather than venture too far with a theory that is most likely going to trigger tremendous opposition by those most loyal to the biostatistics fields. The following are self-explanatory. 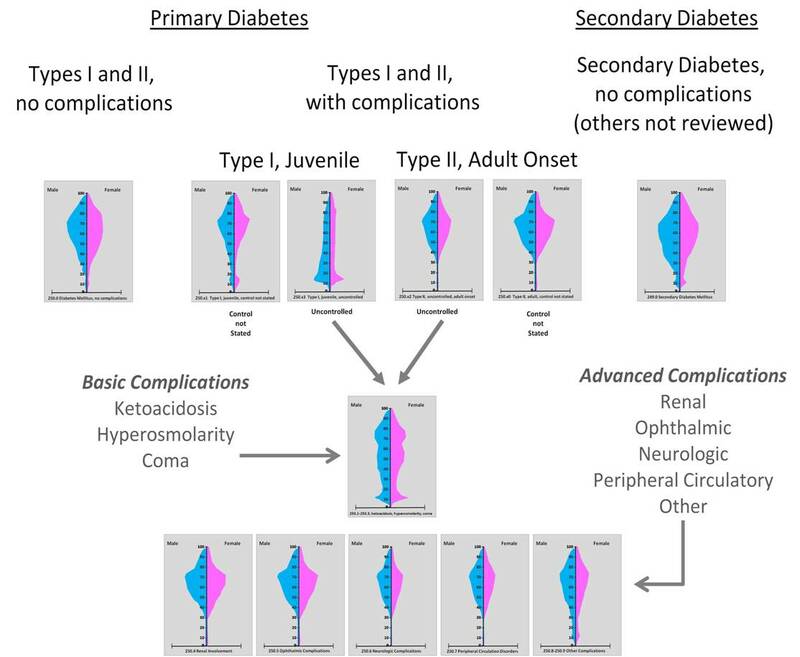 They are demonstrations of how age and gender are interacting with genetics, physiology, psychology, social behavior and the environment to produce these distinct differences between the different groups of ICDs reviewed. Some of these ICDs are reviewed elsewhere as well, either under the age group upon which they have the greatest influences, or in a special topics page located on the table of contents just beneath this new section chapter page. Brief reviews of the data accompany many of these pages, to demonstrate how useful they become when trying to interpret otherwise hard to decipher epidemiological issues and concerns. Nine specific joints were reviewed for dislocations. Their order presented below matches the sequence of the ICD9 identifiers, presented in the following order 830-Jaw, 831-Shoulder, 832-Elbow, 833-Wrist, 834-Finger, 835-Hip, 836-Knee, 837-Ankle, and 838-Foot. The most foretelling outcome for this review was the implication of the very unique distribution of the elbow dislocation [ICD 832]. 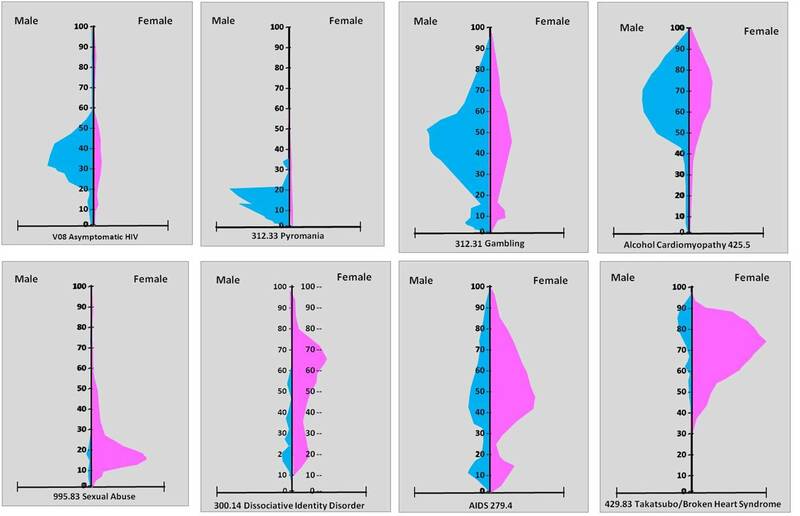 These graphs are measures of prevalence by 1-year age-gender increments utilizing a moving windows method to define the prevalence rates per year. 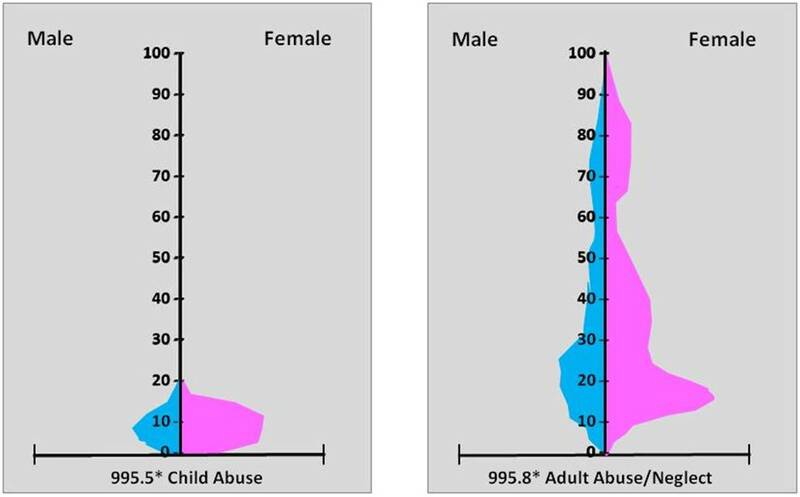 The results of ICD 832 suggest this may be applied as a unique identifier for child abuse cases involving very young children. Elbow dislocations occur due to falls, and mishandling, suspension of a child or picking up a child by one arm, etc. The former suggests lack of parental attentiveness or the expected parental care given to a child as part of the daily child raising experience. It also suggests the possibility of deliberate mishandling of children, and due to its method of identification and notation in the medical records, is perhaps more easy and legally “safe” to document in a medical record than the other indicators of child abuse such as battered child syndrome. The second unique identifier upon which an alert can be based is the hip dislocation frequency noted for older age groups. Hip dislocations are expected for this group, along with hip or pelvis-femur neck fractures, and so reappear in the last decades of life. The higher childhood IP (1-year incidence-prevalence) is due to age and the same reasoning related to elbow dislocations (lack of full joint development); the dislocations noted for later years is in part due to loss of muscular strength but more so due to calcium loss in the bones. Also note the opposing appearance of jaw (female > male) versus shoulder (male > female) dislocations. There are also unique assymetries in the pyramid for ankle and foot dislocations. 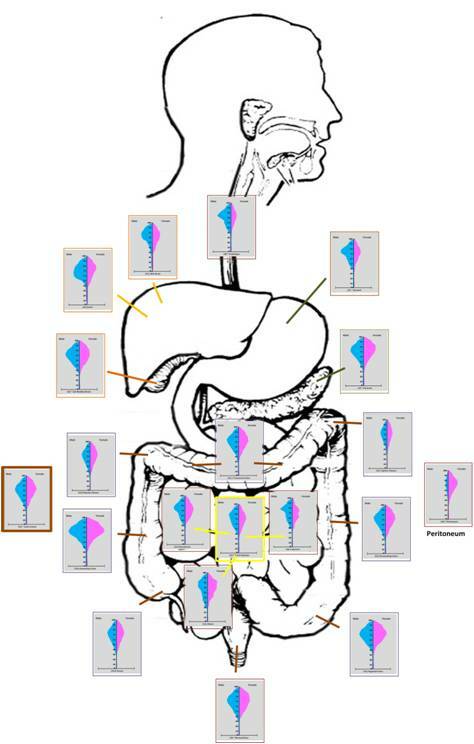 The ostomies graphed above imply old-age, very young (childhood development) and mid-life related events. 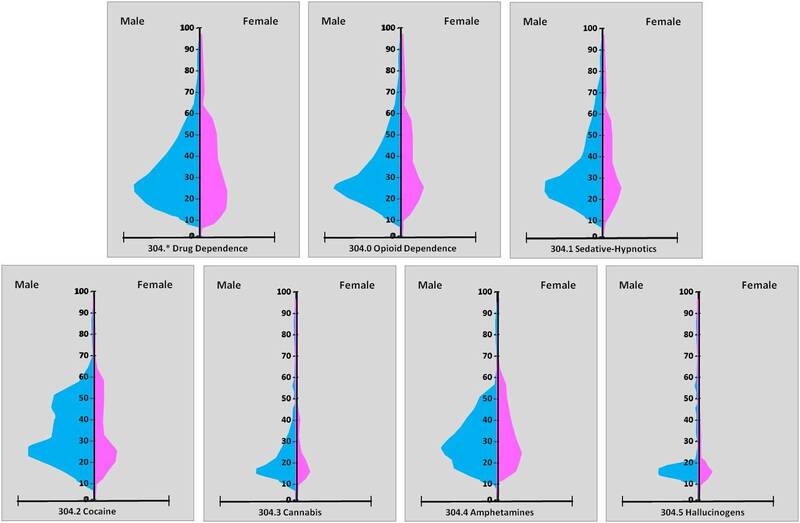 The first two are symmetric, but with opposing peak ages. 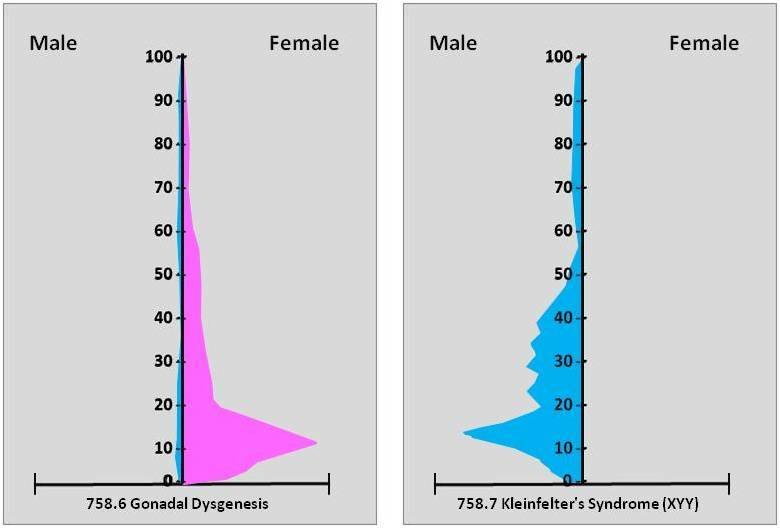 The difference in peak ages by gender for cystostomies demonstrates a unique aging related health problem. The reasons for these procedures in the younger population are probably identical for both genders, but for the older ages are more than likely very different. The above graphs are for health care received by victims of all of the MVAs, just pedestrians involved in MVAs, and MVAs involving motorcyles. Gender-age differences are slight but exist in the first two. 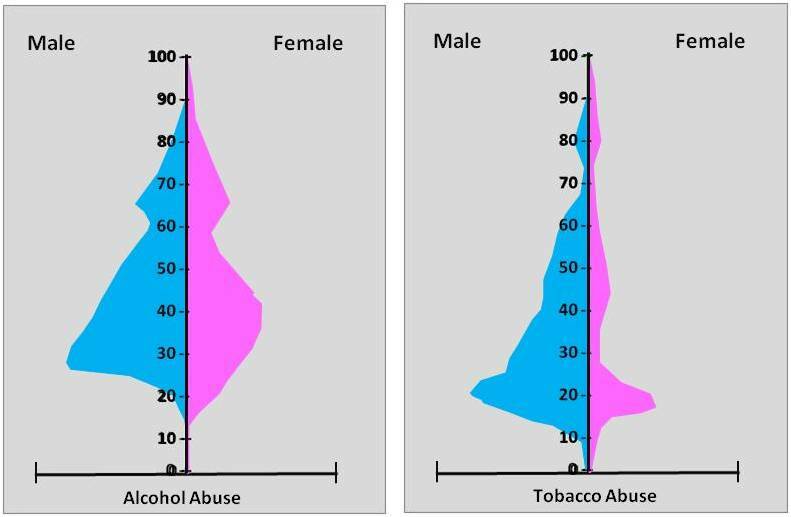 The motorcycle related events demonstrate a strong age-gender asymmetry, with two peaks for male patients (older children/young adults and younger working class) and an identical although much smaller set of peaks for females. Conclusion: Young age is a factor for childhood related amputations primarily for Fingers, but perhaps as well any other lower arm part. 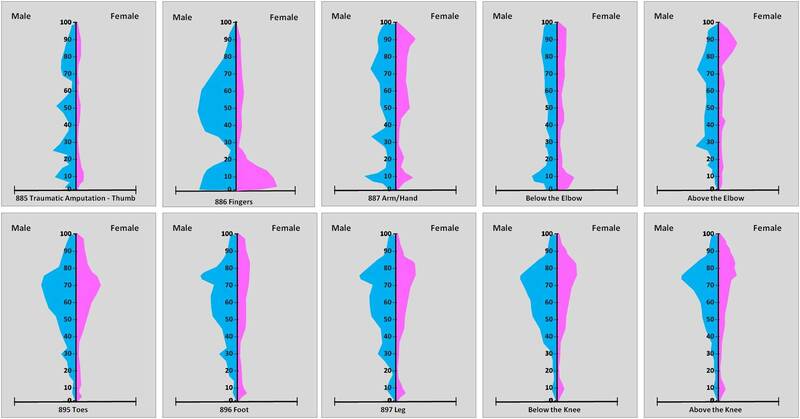 Old Age is most directly related to lower limb amputations induced by accidental means, with below the knee loss of parts most linked to old age. Thumb amputation is the least age-specific amputations, and the least likely to occur for women. Men received far more amputation related injuries than women, especially regarding fingers loss. Which organ transplants demonstrate the most age-related limitations for eligibility? Which organ transplants are most likely to be performed on an infant under 6 months of age? Which organ transplants are allowed even into very old ages (>75 yo)? 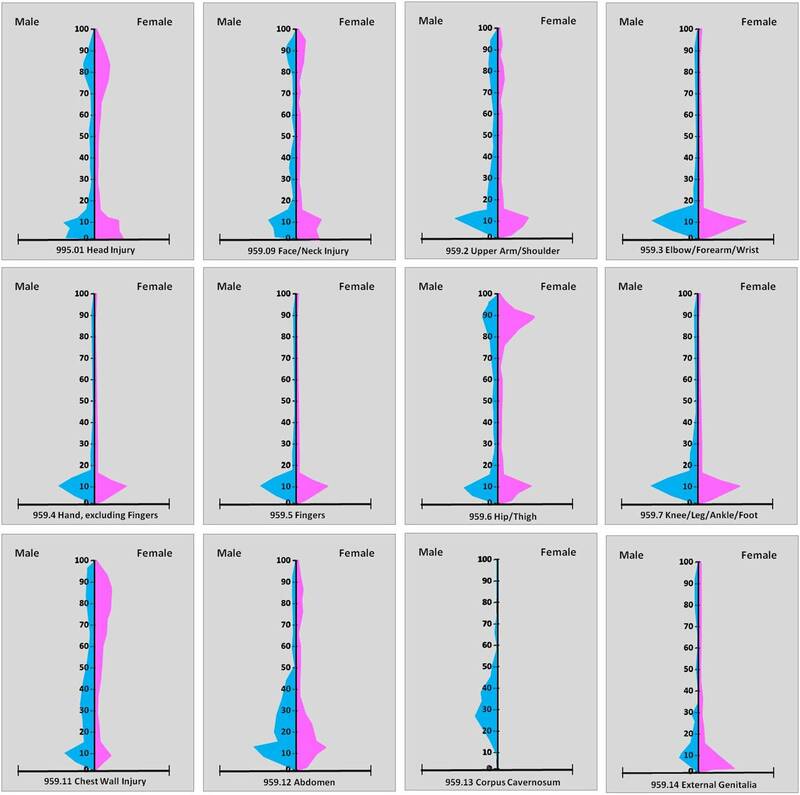 Which organ transplants are most equally distributed between the two genders? Which transplant demonstrates the greatest difference between genders? For working class populations, which organ transplants appear to demonstrate the greatest gender differences?